Last week we launched the Yuppiechef Cooking School with our totally free, online baking course, The Art of Baking. 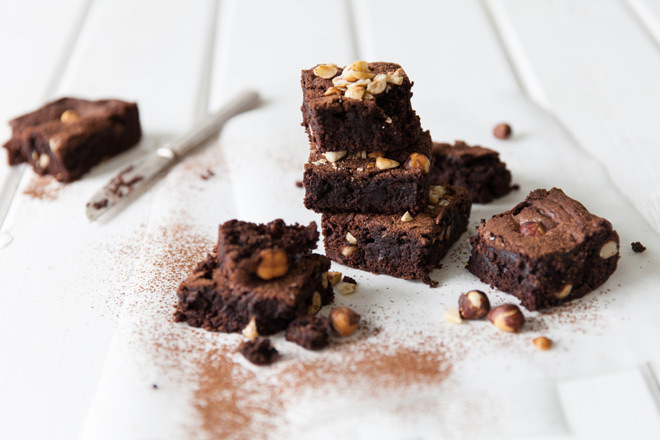 The course is hosted by the lovely Sarah Graham and to give you an idea of the kind of delectable and easy recipes included in the course, here is her recipe for nutty, double chocolate brownies. Trust us, these are a treat and were gone in seconds in our Yuppiechef Test Kitchen. 1. Preheat the oven to 180ºC. Grease a medium-sized, square baking tin or line with baking paper. 2. In a small saucepan, over a medium heat, melt the butter and then add it to a mixing bowl with the sugar and vanilla essence. 3. Add the eggs, one at a time, beating in between each addition. 4. Sift in the flour, cocoa powder and baking powder and gently fold in the salt, nuts and chocolate chips. Add extra milk to loosen your mixture if it seems too stiff but remember that brownies are quite dense so the mixture will be heavier. 5. Spoon the mixture into the baking tin and bake for 25 minutes, or until only just cooked through. 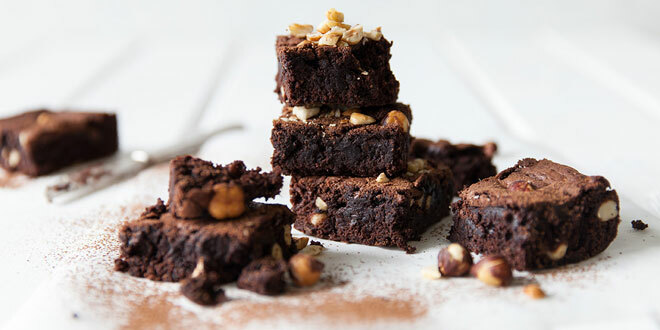 The brownies should be gooey inside. 6. Allow to cool in the tin, cut into squares and serve with a dusting of icing sugar. You can store these in an airtight container for up to four days but all bets are on that they won’t make it off the baking tray. Are you keen to learn how to bake? The Art of Baking course starts with the basics and in no time at all will have you baking fancy, but easy, layered cakes, homemade breads, cookies and more. It’s free so why not give it a go? Recipe by Sarah Graham. Styling by Luisa Farelo.